On the outside, Sarah is a rather shy, introverted person. She's not too terribly confident in herself, both on the inside and the outside, and needs a lot of encouragement to come out of her shell for anyone. There are, however, certain people that she is completely comfortable around-namely, her parents, brother, Graciela, and Hugh. If you aren't immediately annoyed with her bashful, borderline insecure nature (although several are), however, you will be rewarded for putting up at her. Her real personality happens to be quite charming. On that note, Sarah's come a lot more into herself since finding happiness in her life. She's slowly getting a lot better with going up to people and speaking to them, and of course your self-confidence grows when you've got a wonderful husband to tell you how much he loves you every day. She's going back to being not only the happy and content girl that she was while dating Hugh back in Hogwarts, but excelling even past that. Anyone who has known her since before being married can easily note the change. Impish and fun-loving by nature, Sarah's a very laid-back sort of person that you can go to anytime you just want a few laughs or to get away from the stresses of real life for a while. She likes to play practical jokes and make people laugh, and she's a great accomplice to any prank, which she oftentimes becomes. Sarah is loyal and trusting, just like any true Hufflepuff should be, although she is only of average intelligence in both Muggle and Wizarding worlds. While she is almost always quiet, she's not afraid to stick up for what she believes in and always puts her faith and power into the underdog of any situation-she's got a big mouth when it comes to speaking out against injustices, which is how she gained her best friend, Graciela. Sarah Elizabeth Daniels was born in the early morning hours of June 6, 1954 in a plain, Muggle hospital in Surrey to proud but plain Muggle parents John and Elizabeth Daniels. Her plain Muggle parents already had a plain Muggle son, named Michael John Daniels, who was three years old at the time and completely abhoring the thought of a sister, just like any other plain Muggle boy. Her early childhood was spent attending plain, Muggle public schools, with her home life spent in the exceedingly plain, Muggle neighborhood of Little Whinging. Like any other child her age, Sarah loved her big brother but fought with him on a daily basis and would have rather given up her favorite red crayon than admit that she missed him when he went off to school without her. She hated how he was always finding new ways to play mean pranks on her, however by the time this girl was five, she had already developed retaliation pranks of her own. Their parents let it go, figuring it was at least more healthy than them yelling at each other. That was, until the prank wars had to be put to a stop when Sarah inexplicably levitated a bucket of jello above Michael's bedroom door, dumping it on the unsuspecting boy when her parents walked in and she lost her concentration. Sarah's early magical aptitude was not only displayed in this single incidence-there were several other occasions on which the young girl displayed strange or special abilities that could not be explained by her, her family, or any of the doctors they visited. It was a cause for some worry in the Daniels household up until her eleventh birthday, making her reception of a Hogwarts letter almost a sigh of relief. After almost six years of not being able to explain Sarah's oddness, John and Elizabeth were able to accept the letter with a certain amount of ease, needing only one visit from Albus Dumbledore to convince them that their daughter would be in good hands at the school. With Sarah's friendly and gentle nature (her brother was, of course, always a special exception), she was a natural choice for the Hufflepuff house. Despite being quiet and shy, traits brought on by her lack of knowledge about the Wizarding World, she found a few close friends in her house and year and kept them for a long time. Being so quiet and so plain in looks, it was the highlight of her Hogwarts career to find her first boyfriend-and first love-in fellow Hufflepuff Hugh Abbott in fourth year. The two seemed practically made for each other, him bringing her our of her introverted shell to reveal the mischievous, fun-loving girl that she was and her becoming the constant companion that he needed in a girlfriend. The relationship lasted for two years-two of the best of her life, Sarah will still admit to this day—but with Hugh being two years her senior, they were soon separated by his graduation. The two stayed together through the summer following his seventh year and tried to keep contact after she went back to school, but things just did not work out, they grew apart, and by the time Sarah came back from the winter break of her sixth year, she and Hugh were officially over. She was heartbroken, but refused to let him see that, and tried her best to get over him. Sarah tried to date other boys throughout the rest of her Hogwarts years, but no relationship seemed to last, lingering feelings for her old boyfriend inhibiting her emotional progress. Sarah was not sure that she could ever truly get over Hugh, until she graduated and came to the realization finally that she was holding out for nothing. She tried to search him out after school, but found nothing and at last had to give up hope—for months, Sarah immersed herself in the motions of her own life. She woke up, went to work, came home, went to bed, and did it all over again. It took a long time, but with each passing day, she missed him less and less, and at the age of 19, she was proud to be able to say that she was totally and completely over him. She met a man, a patron of the Three Broomsticks (where she worked), and started dating him immediately. Their relationship succeeded far more than the others had, now that she wasn't pining on her ex-boyfriend every moment of the day, and by the time they reached the two and a half year mark, Sarah knew with a certainty that he was going to ask her to marry him. He left her for another woman. Not having even known the affair had been going on, or for how long, or even who it was, Sarah was heartbroken. She recoiled back into her shell, quit her job, and went home to live with her parents for nearly three months before they forced her to get out and get on with her life. She recovered, of course (and she was happy that it only took a small fraction of the time that it took her to get over Hugh) and moved out, finding a new job at Madame Puddifoot's. At the age of 24, Sarah decided that she required a change of scenery and quit that job, taking up an offer at the Ministry as a secretary… for Hugh Abbott. Sarah fell again, and she fell fast. There was only one problem-Hugh was already dating a gorgeous, intelligent, amazing, whorish co-worker of his, Ally Atanasio. Little did Sarah know, however, that Hugh was falling for her again too. The two of them tried hard to hide their feelings, but everything spilled out the night of the Ministry Ball and the two ended up kissing, rekindling the romance that they could now no longer ignore. 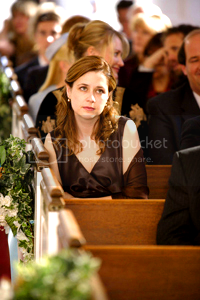 Sarah always felt guilty that it was because of her that Hugh broke up with Ally, but she was more than happy to have back what she had always thought of, unconsciously, as hers. Hugh was hers, as he would affirm a few months later by getting down on one knee and in an impromptu and yet completely romantic gesture, asking her to marry him. The two were wed in August of 1978 in a small Muggle-style ceremony, followed by a fun-filled and childlike honeymoon in Disneyland. The happy couple returned home to their new shared flat in Nottinghamshire and Sarah's considered her life perfect ever since.